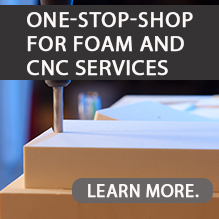 General Plastics’ LAST-A-FOAM® FR-4300 thermoformable foam sheet series is a unique flame-retardant structural polyurethane foam. It is ideal for composite panel cores and other structures where compound-curved surfaces or other details can be made with low-cost heat-forming methods. While it is heat-formable, it retains all the chemical and solvent-resistant properties of polyurethane foam boards. A closed-cell material, it is easily bonded and will accept a variety of adhesives and coatings. This series is non-abrasive and can be machined with standard high-speed steel (HSS) cutting tools. It can also be cut cleanly with water jets and traditional wood-carving tools.